This week a new trial domestic waste scheme was introduced by Redbridge council specifically targeted at flats above shops. The trial is in Woodlands Road, Ilford, between Grange Road and Hampton Road, and covers 50 flats. The scheme is being introduced after complaints from the public about the increase in fly-tipping and the inconsiderate dumping of waste on the pavement in front of shopping parades. 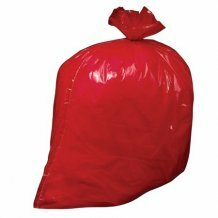 Each property has received a supply of red bags – five per week – with occupiers expected to place their red bags out Monday to Friday only at points between 7pm and 7am to ensure that waste is not left out all day. Use of any other bag, including black bin liners and carrier bags, or putting out waste outside the designated time or in the wrong place may be treated as fly-tipping, and could incur a fine of up to £400. In fact, the scheme has only been in operation for a week and already two fines have been issued, according to a report at the Neighbourhood forum on Wednesday. The pilot will be reviewed after three months and a decision on whether to roll out the scheme more widely will be taken following resident feedback and evidence collected. The problem here is that flats, especially above shops, generally have nowhere to store their waste except to keep it indoors, which is not very hygienic for waste food. However, you can get sealable food waste storage containers (they’re called caddies) – some councils even supply these and collect food waste separately e.g. Tower Hamlets. We wonder if the “fully informed” residents are aware of caddies and have been issued with an orange Redbridge flats recycling bag and pointed to the public recycling point just along the road in Ilford Lane which they could use to reduce the amount of waste building up indoors and the amount they put out for weekly collection. I’m not sure how big these new red bags are but 5 a week seems quite a lot of rubbish when the message really should be to reduce the amount produced in the first place. Mind you, these people recognise the value of a bin: Jen, 37, from Nottingham, laughed: “With three kids, we get through a lot of rubbish. Collections every fortnight mean we end up with bin bags piling up outside and I worry about rats or foxes being tempted into our garden. We bought a second bin online and none of the bin men have ever complained, so it’s solved my problems!” Not to mention everyone else's problem with litter strewn all over the neighbours' gardens and all over the public highway.